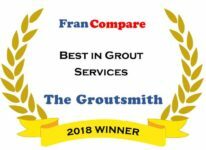 From restaurant management to software consulting, our Groutsmith franchise partners come from a wide array of personal and professional backgrounds. But at their core, Groutsmiths aren’t just franchisees, they have a drive to succeed using a business model they can adapt to fit the way they want to run their business. Check out the list of Success Stories below to learn more about our franchise family and the success they’ve achieved with The Groutsmith. Mike Ketzner, a former real estate executive and franchise broker who, after helping others start successful businesses with The Groutsmith, became a franchise owner himself in 2011. This year, Mike’s business is projected to do $1 million in sales. Dave Goka is an accountant and sales professional turned Groutsmith franchise owner. Since 2012, he and his wife Jan, a former franchise broker, have grown their grout and tile operation in San Diego into the area’s premier service provider. Today, the Gokas are making huge strides toward their ultimate goal: handing their son a lucrative business he can run himself. Like many Groutsmith franchise owners, Lee and Sharon Conti’s story starts with a desire for something new. After finding an opportunity in The Groutsmith, the Contis stepped away from corporate life to put their skills to use as franchise owners. They haven’t looked back since. Brad and Michele are a former cake delivery person and office manager turned Groutsmith franchise team in North Pittsburgh, Pennsylvania. Since starting their franchise in 2017, these co-owners have streamlined their operations, gained a reputation for being the premier grout and tile service in their area, and have taken the first steps toward scaling up. Craig and Julie Sedelmeyer are a Houston couple who left the oil and gas industry to pursue a more fulfilling life as small business owners. Tired of the corporate routine, the Sedelmeyers found an opportunity in The Groutsmith few other franchises offered: a chance to learn a new professional skill, reconnect with their community, and achieve a more comfortable lifestyle.